Pieced cotton quilt in Tea Leaf or Single Lily design. Pieced blocks feature printed diamonds in a floral design with appliquéd stem and leaves, all on a white ground. Pieced blocks alternate with whole blocks of green calico. 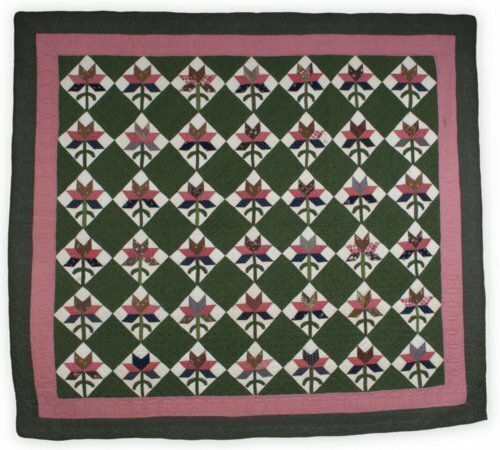 Double border of pink calico and dark green prints. Hand-pieced. Hand-quilted overall in a variety of designs, including outline quilting, scallops, and overlapping circles. Batting is probably cotton. Binding of dark green print, and white cotton backing. Eliza Ann Crowel made this quilt when she was nine years old. Born in Ozawkie, Kansas, in 1863, Eliza moved to Lyon County, Kansas, at the time of her marriage to Frederick Denner in 1880. The family believed this quilt was never laundered.